Most of us know that social media is an essential part of a brand’s marketing strategy. After all, 92% of marketers say that social media is important to their business. And yet, managing it continues to be a source of frustration for many. That’s understandable — there are many moving parts to a successful social media strategy. There’s knowing the right frequency with which to post. There’s the measurement of any ROI on these efforts. And, there’s determining what the heck to post to each channel. There’s technology available, for example, to post the same content to multiple social media channels. But should you be posting identical messages to each network? As it turns out — no. Different channels have different audiences, peak times, and character limits. And each one is built for a different style of writing, which means there’s one more thing to consider: What should the copy for each social network look like? That’s why we put together the guidelines below to compose copy for five different social media channels: Facebook, Twitter, LinkedIn, Instagram, and Snapchat. So read on — and start writing. With 79% of all online adults on Facebook, it continues to be the highest-utilized social network of those measured in Pew Research Center’s 2016 Social Media Update. But out of the channels we’ll cover here, it also has the highest rate of usage among the 65+ audience. When you’re composing text for Facebook, it’s important to keep these data in mind — especially if that’s who your brand is targeting. Let’s say you’re creating a marketing budget and want to decide how to allocate a portion for social media. While we encourage having a presence across all channels, if you’re aiming for the attention of the 65+ audience, this might be the best network for an ad spend or a pay-per-click (PPC) campaign. Focus your energy here, and then repurpose that content for other channels. Make sure your formatting is correct. That’s a big reason why we discourage auto-posting duplicate content across multiple channels — you risk including an “@user” tag that’s only fitting for Twitter or Instagram. Facebook’s character limit on status updates is 63,206. However, that’s far from ideal. Generally, people don’t visit Facebook to consume long-form text or stories — that’s what your blog is for. In fact, Buffer has found that Facebook posts with 80 characters or less receive 66% higher engagement. Plus, less text allows greater focus to be placed on any visual content that accompanies it. Posts with images, for example, see 2.3X more engagement than those without. Facebook is a particularly good vehicle for promoting your external content — things like blog posts, reports, or videos. That’s what 76% of users seek when they visit Facebook: interesting content. But don’t just post a link without a description. Be sure to accompany it with brief, attention-grabbing text that signals what the content is about, or poses a question that it answers. Tweets have long come with a maximum of 140 characters, but that doesn’t include images, videos, polls, or tweets that you quote. 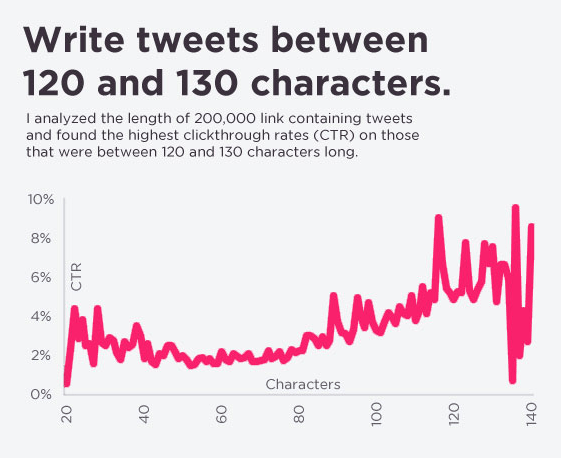 Plus, according to social media scientist Dan Zarrella, the ideal length is actually around 120-130 characters — those tweets showed the highest click-through rate (CTR). When you’re composing copy for tweets, remember that hashtags are an effective way to indicate and summarize what your message is about. Plus, it’s a nice way to become discovered by users who might be using hashtags to search for tweets pertaining to a certain topic — Buddy Media found that all tweets with hashtags get double the engagement. But exercise some restraint with hashtags, and make sure the text that accompanies them comprises the majority of the tweet. 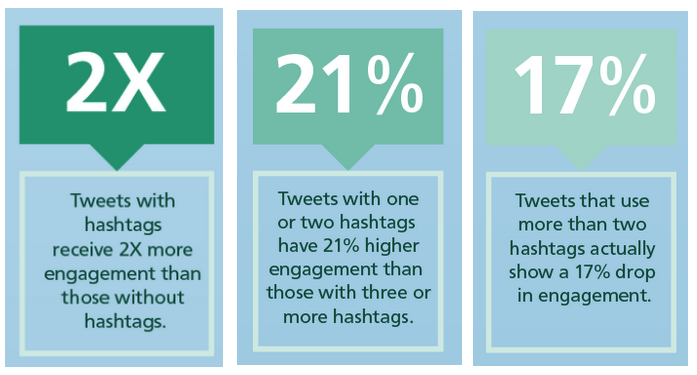 Limit it to one or two — these tweets have a 21% higher engagement than those with three or more. Let’s say you have a bigger audience on Twitter than on Facebook, but you want to build your presence on the latter. Twitter can be a good vehicle for driving traffic there, by promoting things like live streams that will be taking place on your page. LinkedIn has become an interesting content distribution channel. Users can share simple post updates, usually business-related (think: job openings and professional conferences), and push them to Twitter at the same time, though we don’t recommend that — see our note on the problems with identical content across different channels. But in 2012, LinkedIn introduced its Influencers program, which recruited notable business figures to guest blog on LinkedIn’s publishing platform. Eventually, that platform became open to all LinkedIn members in 2014, positioning it as an outlet for people to share original content with an audience much larger than they may have received on their own domains. That’s part of decentralized content: A concept that allows users to share their work that has been published elsewhere on a content creation platform. Unlike most social media — where limited content is displayed — the full text and images of the work are shared, with the original author and source credited, on a site different from its origin. That makes LinkedIn a good place to re-post and link back to your blog content. But why make the duplicate effort? Well, consider this: 29% of all online adults use LinkedIn. Does your blog have that kind of reach? If it doesn’t, you can reach LinkedIn’s larger audience by syndicating your own content on their platform, drawing more attention to your work. According to Andy Foote, the character limits for these posts are 100 for the headline, and 40,000 for the body. Since Instagram is, first and foremost, a platform for sharing photos and videos, the primary focus should typically be on your visual content. But it’s helpful to provide context that lets users know what they’re viewing — within reason. Like many of the other channels we’ve discussed, people don’t use Instagram to read long-form content. And while Instagram doesn’t appear to specify a maximum total number of caption characters, it’s cut off after the first three lines. That’s why we recommend limiting captions to that amount, and if you require more text, make sure the most important information — like calls-to-action — is included in the first three lines. Hashtags, @mentions, and extraneous details can go toward the end of the copy. Here’s a good example from New York Magazine. Without pressing “play,” the post appears to just be an image of a laundry basket — something that could mean any number of things without context. But the caption is used to indicate that the magazine recently did a roundup on the best socks for every occasion. Cute, right? Whether you are working out at home or hitting the town, there’s a sock for every occasion. And yes, #TheStrategist even found knee-high no-show socks, kind of like Peds on steroids, to wear with heels. From colorful and soft to non-slip and functional, your feet will thank you later. Go ahead and tap the link in our bio to see the best socks for women. Using your caption to provide context is especially important when sharing videos. These typically automatically play without sound, so use the description to let them know what they can’t hear — and maybe even motivate them to listen. And about those hashtags: Unlike Twitter, it’s okay to use more than two here, but it’s advised to use less than eight. 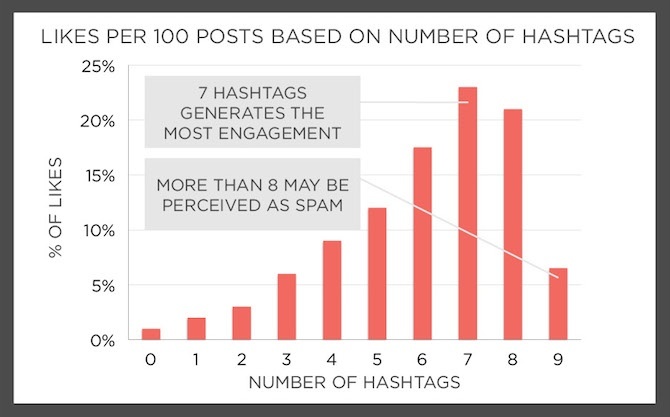 According to research conducted by Piqora, the sweet spot seems to be around seven hashtags — those Instagram posts seem to get the most engagement. As for Instagram Stories, there doesn’t seem to be a ton of detail on character limits there but because the text overlays the visual content — which is the focus — don’t obscure too much of the photo or video with a caption. While we’re on the topic of not obscuring visual content, let’s discuss Snapchat. Again, because the focus here is on the visual, you’ll want to prevent distracting viewers from it with too much text. Then, it shared a series of animated images and videos all pertaining to the topic, ranging from recipe tips to clips from the network’s show, “Cutthroat Kitchen.” It took a simple topic — coffee — and expanded it into engaging, consumable content to highlight what the brand does best. 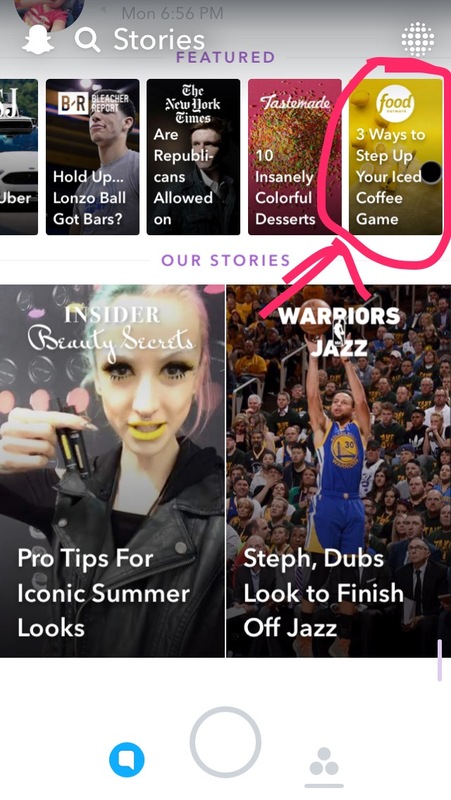 Notice that for certain parts of the story, there’s a call-to-action at the bottom to “Watch” or “Read.” While Snapchat doesn’t make this entirely clear, it seems like that’s strictly a feature of ads, and not something that can be added organically. However, if your budget permits, adding these CTAs is another way to drive attention to you longer-form content. Managing your brand’s social media presence is no simple task, but it’s more than possible. And now, writing creative, compelling copy for your various channels can become a fun task. Draw some information about your audience composition for each social network. Then, see how that compares to the usership data from Pew Research Center. From there, you can see where you have the most active audience, and how you can repurpose content from one channel to draw attention to another one — and attract website traffic. How do you create and repurpose copy for social media? Let us know in the comments.